A look at its storied past and a preview of an exciting new season. The early-evening sky was imbued with the setting sun's deepest red hues, high clouds extending in a flow like fingers over the open waters of Lake Erie and the people-packed lawn of Liberty Park. It was a rich, deep-color backdrop for a colorful, history-rich night in the Flagship City. On the lakefront amphitheater's stage, Conductor Daniel Meyer led the Erie Philharmonic — and its audience of thousands — through soundscapes familiar and new, carrying an array of orchestral color across the cooling air. That performance was circular in time, sounding the opening of the city philharmonic orchestra's 100th year while bringing Erie's two-year-long Perry 200 celebration to its formal close. "We're here to honor our past, celebrate our present, and look forward to our future," Meyer said as he welcomed the crowd to the Phil's recent season-opening free performance, one of a trove of concerts and events lined up to highlight the city orchestra's 2013-14 season. A big cross-section of music appreciators started the experience with that recent opening night: Crisply-dressed, wine-sipping patrons all set up at neatly-arranged, well-stocked tables; parents and their kids, and cozy couples young and old, camped out on the lawn with blankets and folding chairs and plastic coolers; and the guy right down front — an average-Joe-looking, 30-something dude, throwing back a big can of Coors Light, happily cheering (at all the appropriate times, mind you) with a nice, big "WHAHOO!!! !," or a "You killed that!!!" That's good, honest appreciation right there. And, like the Lake Erie region itself, "our audience is extremely diverse," said Beardsley-Petit. Whoever you are, whether you've spent a lifetime appreciating it, are just now getting to know and love it, or have never heard it at all, live orchestral music "is all about the experience. It's hard to put into words," Beardsley-Petit said. Very true. When it comes to talking about most intangible experiences, words can be fleeting, fast forgotten. But luckily, the Phil's orchestrating it in music — a wide array of world-class classical music, played by world-class classical musicians — from now through next year. On top of that, there's a slew of ongoing and upcoming programs and events — ranging from the annual Beat Beethoven 5k on Sept. 22 to the Phil's Play On! Anniversary Party and Instrumental Art Auction on Sept. 28 — that, along with being part of the celebration, are examples of how the Phil is actively adapting, reaching out to its community and partnering with other organizations in a range of efforts to stay vital, viable, and valuable to Erie-area audiences. As it all gets under way, the Phil's members and leaders are hoping that, like all music worth hearing, the sounds of this special season speak for themselves. And, like all historic institutions worth supporting for the long run, the orchestra is hoping its work still, and always, speaks to — and for — its home city's past, present, and future. The term 'orchestra' actually comes from the ancient Greek word for the space in front of a stage usually reserved for a chorus. Good to know, but we won't take this all that far back. We'll keep it local, all-American. The earliest efforts at establishing a symphonic city orchestra in Erie — way back in the 1890s — basically fell flat on the ears of a generally non-supportive general public, according to the Phil's historical accounts. The city's and region's then-foremost musicians didn't lose heart, however, and continued in their attempts. Between late 1912 and early 1913, they succeeded — almost — getting as far as meeting up and mapping out an elaborate spring premier (with upwards of 50 musicians under the direction of Maennerchor Club music director Albert Glaser) that was to feature first-time-here major performances of hot-ticket stuff like Tchaikovsky's "1812 Overture" and Grieg's "Peer Gynt Suite." But, for reasons apparently now unknown, that event (along with that version of the orchestra) was canceled somewhere right around the last minute. Resounding their cause, the players and their instruments didn't stay quiet much longer after that, though. A few months later, the Erie City Orchestra was officially born, and, ready to be seen and heard, debuted under the direction of Conductor Franz Kohler at the Colonial Theatre before a 750-person audience on Nov. 30, 1913. Over the ensuing years, the orchestra underwent several iterations: It reorganized as the Erie Second City Orchestra in 1921, then again as the Erie Second Philharmonic in 1932; it disbanded for the duration of World War II; and it officially incorporated as the professional Erie Philharmonic in 1947. Dr. Peter Scibetta, an Erie native and a (now-retired) longtime local cancer physician who's served on-and-off on the Philharmonic's board of directors for nearly 50 years, recalls seeing his first Philharmonic performances right around that time. "I remember when Jascha Heifetz played [in the late 1940s]. He was probably the most famous violinist in the world" in those days, Scibetta said, adding he heard many different artists from across the world's stages over those early years. And the next couple of decades played host to plenty of top-tier performances, along with the formations of the Philharmonic Chorus and the Erie Junior Philharmonic, the first of the orchestra's ever-popular, long-running "Pops" series performances (which, then and now, have mixed up the standard orchestral experience by offering symphonic renditions of modern popular hits), the celebration of the Phil's 50th anniversary season in 1963, and, in 1974, the orchestra's first concert at the Warner Theatre — that grand Erie showspace the Phil continues to call home today. In that and all the forms leading up to it, Erie's symphony orchestra "has been around for such a long time. It's really been part of the fabric of the community," said Beardsley-Petit. And throughout its history, the orchestra has seen the participation of a dazzling list of world-renowned guest artists — Duke Ellington, Doc Severinsen, Yo-Yo Ma, Itzhak Perlman, Helen Traubel. That list has expanded down through the decades, and the tradition has continued. The Erie Philharmonic, "over the years, has transformed into fully-professional orchestra," said Meyer, who's served as the Phil's conductor and music director since 2007. Before him, the Phil's lineage of hand-selected, celebrated conductors extends back across the century to 11 others: Hugh Keelan, who served as director between 2000 and 2006, Peter Bay (1996 - 2000), Eiji Oue (1990 - 1995), Walter Hendl (1976 - 1990), Harold Bauer (1973 - 1976), John A. Gosling (1967 - 1973), James Sample (1953 - 1967), Fritz Mahler (1947 - 1953), John R. Metcalf (1931 - 1947), Henry B. Vincent (1920 - 1926), and Franz Kohler (1913 - 1916). Meyer, who also directs the Asheville (N.C.) Symphony and has conducted major symphonies across the country and in Europe, said in his considerable experience — and across history — it's been the cities born of heavy industry, that have seen all its grit, its heydays and dark days (places like Erie, Detroit, Pittsburgh, Cleveland) that "all have the best orchestras." "It's that industrial history, and this idea the founding fathers had of being world-class, that fostered a world-class orchestra," Meyer said. Today, he added, "we are the stewards of that amazing tradition — for Erie, and of Erie." Scibetta's been a living witness to that tradition. Having traveled extensively in his medical training days and after — and always having been on the lookout for a good musical escape — Scibetta said he's seen "the role the symphony orchestra plays in so many different locales. ...[And in Erie], so many people have put so much effort," calling it a "cultural jewel." "And here we are – now one of the oldest orchestras in the country, and still going strong," Scibetta said. Heading into this season, "we really want to celebrate 100 years of symphonic music in Erie," said Meyer. And, along with "a lot of love," he said, "we have invested an enormous amount of time and energy into making this 100th anniversary season even more special." The Phil's aforementioned, ultra-popular Pops Series — which Beardsley-Petit said usually has several sold-out performances each year — kicks off Oct. 12 with an opening-night concert featuring four-time Grammy Award winner and Emmy Award winner Arturo Sandoval, the famed Cuban jazz trumpeter, pianist, and composer. "I can't wait to work with him," said Meyer. Principal tuba player and Allegheny College band director/music professor Dr. Lowell Hepler, who's been with the Phil for the past 33 years, is looking forward to it too. "You don't get much bigger names than that," he said — unless, of course, you're talking about all those other big names that have (or soon will) grace the Warner's stage with the Phil's full compliment. "At the professional level, [the symphony] is surrounded by people of remarkable talents," Hepler said. Whether they're minor part-time players or world-distinguished guest stars, "they all have to want to come [to Erie] to do that," he said, and it's because "the level of the music is there." "The orchestra, it's an intimate kind of thing," Hepler said. "Just to be up there, surrounded by that sound, and to get the response from the people," he said, is what gets them there in the first place, and "it's what keeps us coming back." In December, everyone's invited to "Come Home for the Holidays," the Phil's "signature prelude to the Christmas season," with a return guest performance by audience favorite Sasha Voinov, as well as guest artist Andre Segovia. Heading into 2014, the Pops Series will bring "Broadway Romance" to Erie in February; "Pixar in Concert" in March; and "A Tribute to Motown" in May. Kicking off this season's Symphonic Series on Oct. 26, the Phil is showcasing Stravinsky's "Rite of Spring" — which has its own 100th birthday this year — with violin virtuoso Gil Shaham. From there, it's time to celebrate a "Century of Music" on Nov. 9, when the Phil will feature Erie composer Albert Glinsky's "Sun Chanter," an overture specially commissioned for the orchestra's 100th anniversary. Beyond that, there's "Mozart and Mahler," "Pictures at an Exhibition" and "Carmina Burana" in symphony in coming months, along with an array of special performance and community events like the Phil's annual Mother's Day Dinner and Concert and its season-culminating Viennese Ball in May. The symphony wants "the entire community to come and celebrate and honor the fact that 100 years of providing live music in Erie is an accomplishment," said Beardsley-Petit. "We're very proud of it," she added. "And we're very thankful." The Philharmonic actively recruits, auditions, and hires professional musicians from Erie and other areas under collective bargaining agreements between the musicians' union and the symphony's board of directors, according to leaders. Some auditions — which, under strict policy, are all blind, by-ear-only affairs for those judging the candidates — have been happening in recent weeks, according to Beardsley-Petit. Like the Phil's patrons, "our musicians come from all over," she said. "Maybe a quarter of them are Erie residents," while the rest hail from various other points, including Pittsburgh, Buffalo, Cleveland and other eastern U.S. cities as well as Canada and, at times, even further abroad. While the Phil's not quite as large as the professional symphonies in some of those more-major metropolitan areas, Erie, being situated within easy distance for both players and audiences traveling from them, "[has] a really geographically-enviable position" in the world of music, said Hepler. That's because "it's not at all unusual" in that world, Hepler said, for orchestral pros to share their time and talents with a number of symphonies across the regional map. And when it comes to their talents, wherever they are and whatever stage they may be on, "these players can certainly hold their own chairs down," said Hepler. Looking to fill an empty organizational seat off-stage, the Phil's heads are also currently interviewing several candidates for the position of symphony executive director, which has been open for several months following former executive director Audrey Szychulski move to that position with the Springfield (Mass.) Symphony Orchestra earlier this summer. Szychulski was hired in Springfield following a months-long national search, and had served as the Phil's executive director since 2010. An announcement on who's been selected to fill that vacant spot is expected in coming months, Beardsley-Petit said. This year is also the final one in Meyer's current contract, she said, so negotiations aimed at keeping him on board for at least another six years will be forthcoming as well. Known for pushing new limits by melding standard, core classical compositions with others more modern and off the beaten path, Meyer's also conducted for a long list of other orchestras throughout the country, including the Cleveland Orchestra, Utah Symphony, Rochester Philharmonic, San Antonio Symphony, Jacksonville Symphony, Richmond Symphony, and Chautauqua Music Festival Orchestra. 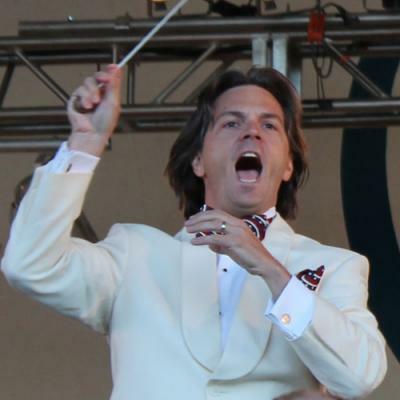 If Meyer and his baton stick around, he'll join the ranks of the Erie Phil's longest-serving directors; Metcalf conducted for 16 years, and Hendl and Sample both had 14-year local runs, while the previous other conductors each occupy spans of six years or less on the orchestra's historical timeline. "We're very fortunate to have Daniel with us," Beardsley-Petit said. "He's certainly been a wonderful asset for this organization. Along with bringing his acclaimed musical approaches to Erie's most world-class stages and events, "he's a very big spokesperson for continuing music education in schools" and elsewhere throughout the community, she said. The basic goal and hope, said Meyer, is to bolster wider knowledge and appreciation for classical instrumentation by further exposing the community-at-large to all the forms it inhabits. That kind of hands-on outreach and exposure at the local level may now be more important than ever; there's been word recently of plans for some higher-level area music and music education programs to be dissolved, as Edinboro University of Pennsylvania reportedly has its music programs on the short-list for phasing out due to declining enrollment and budget deficits. The stated mission of the Erie Philharmonic — a nonprofit that operates on a roughly $1.5 million annual budget largely supported through donations as well as ticket sales — is "to strengthen our community and region by providing high-quality live orchestra concerts and programs that enrich, entertain, and educate people of all ages." To accomplish that, Meyer said, the orchestra continually needs to develop, maintain, and find new ways to reach audiences who may not normally attend, while also catering to the tastes of those who normally do. That means staying lively and wide-open, being inventive and adventurous for all of us who make up the pop-culture-saturated masses. Luckily, wherever or whoever they are — sharp-dressed elites out on the town, inner-city kids at funding-strapped schools, that awesome guy hootin' it up with his big beer at Liberty Park — Meyer said in his experience in Erie, "our audiences are knowledgeable about music — and very opinionated — but also very open to new experiences. People tend to be very receptive, and look forward to that adventure." When it's at its very best, music tends to have that effect. It's equalizing, spirit-moving, and, well, just a damn good time. And throughout this season, the Erie Philharmonic — 100 years in and at the top of its game — is offering its very best, Meyer said, "as a thank-you gift to our audience and community." I think back for a minute to all the different faces I saw across Liberty Park's lawn, seeing and hearing the orchestra perform out in the open air. As the music swelled and the sun set, everyone there, viewed under the same warm light, seemed absorbed in the moments — and they all looked to be truly enjoying the Phil's present. Ryan Smith can be contacted at rSmith@ErieReader.com, and you can follow him on Twitter @RyanSmithPlens.